Carved out of clarified horn, two groups of three fern leaves make up the center, while two smaller sets taper off at the sides. An artist can say many things with one line. Lalique used a curved line of rose-cut diamonds mounted in gold. The beginning of the line forms the base of the diadem and continues to become center-fern stems. On top, the line branches off to form the side-fern stems. Off the base, two smaller diamond branches unite the smaller ferns. The piece, c. 1905, and sold at Christie’s for $66,000 on Oct. 11, 2006. Its provenance can be found in Sigrid Barten, René Lalique: Schmuck und Object d’Art 1890-1910, Prestel Verlag, München, 1977, page 175, plate 31. For more scholarly research, please examine these books, which can be found in our Resource Library. Barbara Steinberg is the daughter of the late conductor Benjamin Steinberg, founding Artistic Director of the Symphony of the New World, the first fully integrated orchestra in America. 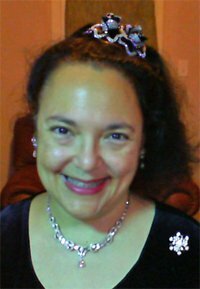 She has been an online community manager for 20 years, including creating the first multimedia community on the web in 1998, to managing a community of CIO's at Computerworld, to moderating online safety in massively multiplayer online games like Habbo and Moshi Monsters. She is also a life-long collector of hair ornaments. 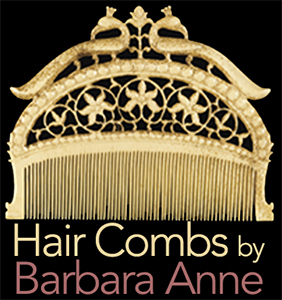 BarbaraAnne's Hair Comb Blog started 15 years ago because antique dealers were treating hair combs like the throwaway items of estate sales. An online movement to change this and showcase collections exhibited in museums was needed. For her work, she was invited to present with The Creative Museum. Delightfully, her blog community has merged with the Ethnic Jewels community to add more richness and scholarship to the field of Ethnic Jewelry. BarbaraAnne and all the kids around the world at Habbo send a message to you: Peace on Earth.